Hazmat Storage Buildings from U.S. Chemical Storage are designed to contain your hazardous materials with safety and compliance. This means that, from start to finish, your hazmat storage building is handled by experienced engineers who are dedicated to constructing a product to provide increased protection to your personnel. U.S. Chemical Storage protects your reputation as well as your well-being with our hazmat storage buildings. Our buildings are hand-welded with superior workmanship by our experienced staff in any of our 5 American facilities. Compliance in hazmat storage buildings means you’re spared hefty unwanted fines, and your building will be constructed to mitigate any hazards associated with your materials. It’s our duty to help you achieve this goal. Hazmat Storage Buildings from U.S. Chemical Storage are designed for safety and compliance. When you come to U.S. Chemical Storage for your hazmat storage buildings, our dedicated engineers work diligently to bring you a product that exceeds all others as far as reliability, durability, and safety. Not to mention, our buildings are FM Global and Warnock Hersey approved, streamlining the hazmat storage process and saving you valuable time and money. There are no substitutes for hazmat storage buildings you can rely on during harsh conditions such as extreme temperatures and seismic activity. Your hazmat storage buildings serve to protect your hazmat inventory – and therefore your facility, community, and environment. There are a number of considerations that go into selecting and designing your hazmat storage buildings. If your hazmat inventory is flammable or explosive, corrosive, toxic, or an oxidizing agent, U.S. Chemical Storage has accessories to furnish your hazmat storage buildings and mitigate these hazards and protect your personnel. Personal safety equipment can be installed within your hazmat storage buildings for increased protection in hazardous situations. 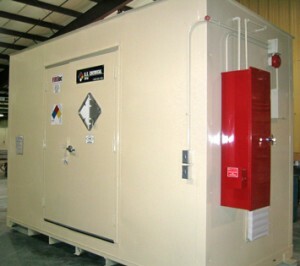 Our hazmat storage buildings are fully customizable, from size and color to the number of doors. We understand the many factors that go into achieving compliance in hazmat storage, and we’re prepared to help you through the process any way we can.